It’s been way too long. Summer has come and gone in a blink of an eye and now fall is on the horizon or if you’re shopping in Target right now…apparently Halloween is too. Blah, blah, blah…it’s the same story every year as moms get teary-eyed sending their kids back-to-school with a new pair of shoes, a shiny new backpack, new clothes from amwholesaleclothing.com and new snacks and at the end of the day they have their kids back at home playing video games and getting lol wins. Everything is new again…until it’s not. Soon they are bored with the new snacks, the shoes are already ruined or outgrown, the clothes now have ketchup stains on them and the backpack is no longer shiny but rather is covered in dirt. Just as you’re done cheering that you have a little more free time to yourself, it makes a quick U-turn into back-to-school blues. This year Mama’s family is in a bit of transition as we await the move into our new house but is just being prepared by different construction companies and professionals from different sites as www.palmbeachroofingexpert.com/. We spent the summer packing and moving from hotels to condos and then moving again. We’re still waiting to arrive at our permanent destination which should come any day now. At first it was fun moving around and playing around in different areas of town but now that the back-to-school routine has kicked in…it’s no longer fun, plus I’m dealing with one of my kids that have adhd, thankfully I know a few adults and a lot of children that swear by the impact that focus vitamins can have on their performance, so I’ll give it a try, I also heard that there are some pills from Afinil.com that help with concentration. Mama longs for a permanent routine and residence and the kids are also following suit. So as we await our stuff to finally be taken out of storage and for long-lost toys to be reunited with the kids, it was just perfect that to appease them on a long hot day that Mama found a box that was first lost in the mail then shoved away in a closet among other boxes. The kids couldn’t wait to see what was inside because one of the perks of Mama’s job is for exciting stuff to arrive on our doorstep like portable changing pad, but because of the move…it’s been way too long since a box arrived. It was like Christmas Eve up in our little condo we call home! 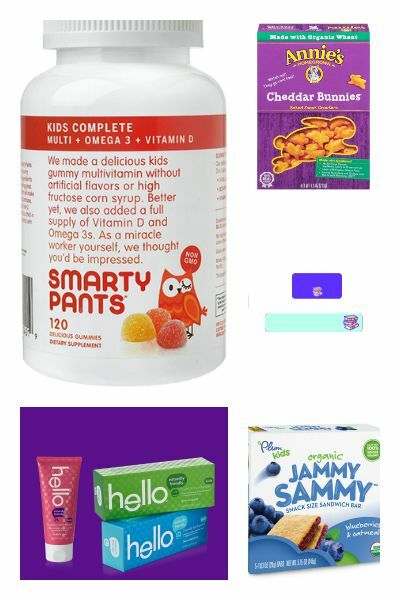 I’ve never seen three kids get so excited about getting their own private tube of HELLO toothpaste, Annie Organic Bunny Snacks, SmartyPants vitamins, Plum Organics Mashups squeeze pouches and Jammy Sammy snack sandwiches. There were also coupons tucked in for a Mabels Labels Back-to-School pack and French Toast…I immediately claimed those for myself. Excited is all I can put into words, when I found out that with cdon rabattkod coupons I was able to buy some school material online. Upon the box opening there was snack taste-testing…Jammy Sammy sandwiches for the win according to the littlest one that doesn’t ever eat anything that resembles a sandwich and the boy rocked the Cheddar Bunnies like there’s no tomorrow. Lily-girl taste tested every Hello toothpaste in the box which was bubble gum, green apple and blue raspberry — she declared green apple the winner. I was just excited that she brushed her teeth right in the middle of the day and wasn’t one of the required “twice a day brushing.” The other two had to fight for the rest. Oh, and the SmartyPants gummy vitamins are a winner because really, who doesn’t love gummy vitamins? I remember having to choke down horse pills as a kid with water and having a nasty mineral taste in my mouth all day long. These kids have no idea the torture we went through when it came to vitamins! So when I went to research more about the vitamins that my kids just ate like candy (literally), I was ecstatic to realize that they make adult versions. Hopefully, SmartyPants will get me to take vitamins after being forced to take them as a kid. I ordered pretty new shirts and leggings from French Toast for Char because the other two (fortunately and unfortunately) have a required uniform from that can only be purchased from a school vendor. How awesome that you can get uniform basics and casuals for less than $10…she was grateful not to be hand-me-downs, I’m sure. Then we spent the next hour labeling all of our new supplies with our new Mabel Labels stickers. Everything from their toothpaste to their water bottles which can also personalize at sites as https://customwater.com/, and to their claimed snacks got a label — no joke. If your child has allergies, check out the Mabels Labels allergy alert labels — great for preschoolers that may or may not know what they can and can’t eat yet. And this my friends is what we did to celebrate Back-to-School in Mama’s house…there was no Pinterest signs this year or handmade cookies to welcome them home from their first day of school. It was a box of goodies that are new favorites for the year…what more can you ask for?! Happy Back-to-School (and yes, now I too can celebrate as the littlest one has just officially started today)! ***Samples were provided to Mama as part of the Savvy Sassy Scouts program via Savvy Sassy Moms. All opinions are my own…and my kids.